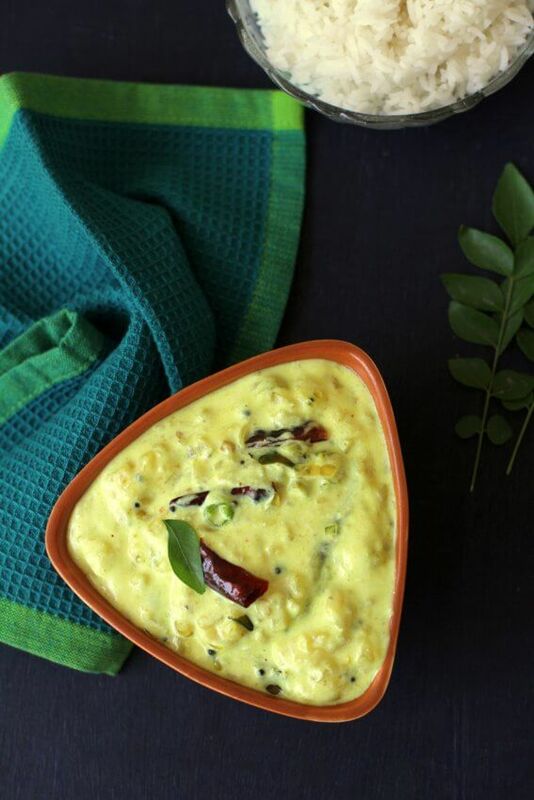 Mamidikaya perugu pachadi is a traditional, Andhra style, spiced raw mango yogurt chutney or raita. 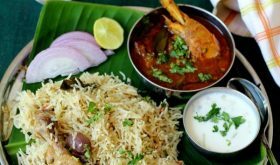 A regular everyday summer recipe that is prepared as part of a typical South Indian or Andhra thali that includes, dal, rasam, stir fry and a vegetable curry. With no dearth of mangoes, the mango mania continues at my home. Almost every other day I am making a mango based dish, either savory or sweet. 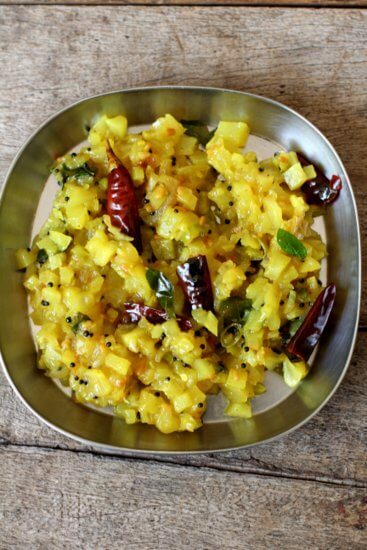 Mamidikaya perugu pachadi is a simple, straightforward vegetarian recipe where peeled, raw mango pieces are sauteed in a tempering of spices before being combined in smoothly beaten yogurt or curd. Usually, herbs, spinach, vegetables like tomato, okra, eggplant, raw plantain, beetroot, carrot and the likes are used to make perugu pachadi or tempered spiced yogurt based chutney. The vegetable is pre-cooked before combining it with creamed yogurt. Today, we are using raw mango that is not too sour and few shallots in place of vegetables. 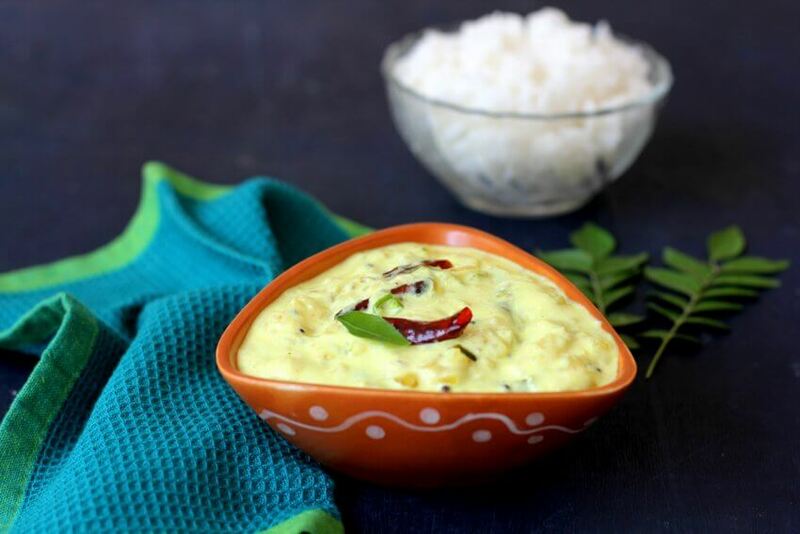 A tempering of mustard seeds, split gram dal, dry red chilies, asafoetida and curry leaves lend a perfect flavor and aromatic touch to the pachadi. You will find the chutney is high on ‘tartness’ with a subtle touch of spice. Ensure you use fresh thick yogurt that is not sour. It makes for a quick and easy chutney on days you are rushed for time and want to make the most of the seasonal raw green mangoes. 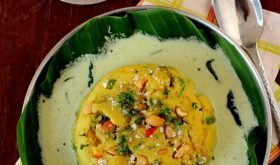 Like most Andhra pachadi varieties this easy mango pachadi is sure to appeal to all age groups and makes for a great side with plain rice or roti. 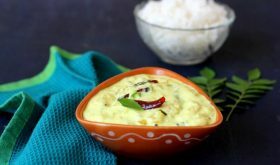 There is another version of the mamidikaya perugu pachadi where fresh coconut and green chili are ground to a paste and added to the beaten yogurt. 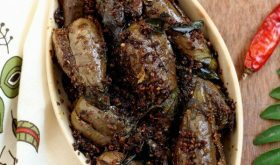 Heat oil in a wide cooking vessel, once hot, add mustard seeds and allow to splutter. Add urad dal and allow to turn red. 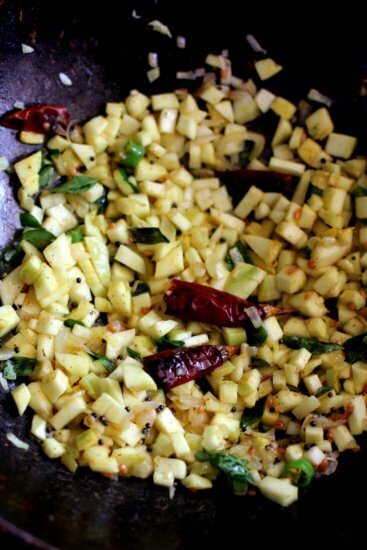 Add the dry red chilis, asafoetida, curry leaves and saute for few seconds. Immediately add the chopped shallots and green chilies and saute for 3 mins. Add the chopped mango pieces and turmeric powder and saute for 3 mins. Sprinkle little water, add salt to taste, place lid and cook on low-medium heat for few mins or till the mangoes turn soft. Turn off heat and cook the mixture. In a bowl, beat the fresh yogurt till smooth. Add 1/4 cup water and mix well. Add the cooled, cooked mango mixture to the yogurt and mix well. Adjust salt if required. Garnish with fresh coriander. 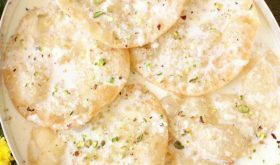 Chill the pachadi till serving time. Use mangoes that are not too tart. Use fresh, thick yogurt that is not sour. 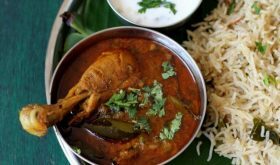 Coriander leaves is optional though curry leaves are essential for the pachadi. Looks really yummy. Wanna try this for sure. Thanks for the recipe.